Viklankin saa kaatumaan - yleensä virheen, mutta joskus ihan vaan yllättävän puuskan seurauksena, kuten nähtiin Helsinki Regatassa - vai mitä sanovat kokeneet purjehtijat Ville, Riku, Pasi ja muutama muu allekirjoittaneen ohella...loistavista gasteistamme puhumattakaan. Koska kippaaminen on olennainen osa jollapurjehdusta, on äärimmäisen tärkeää a) olla pelkäämättä kaatumista sen kummemmin ja b) laatia valmis strategia miten vene saadaan pystyyn. Ohessa erinomainen artikkeli lyhyenlännältä jenkkipurjehtija Carol Croninilta, jonka juttu Hesan regatan uimakoulun jälkeen herätti muutamia ajatuksia asian ympäriltä ainakin allekirjoittaneen päässä. I usually write articles when I have a solution to a particular problem. 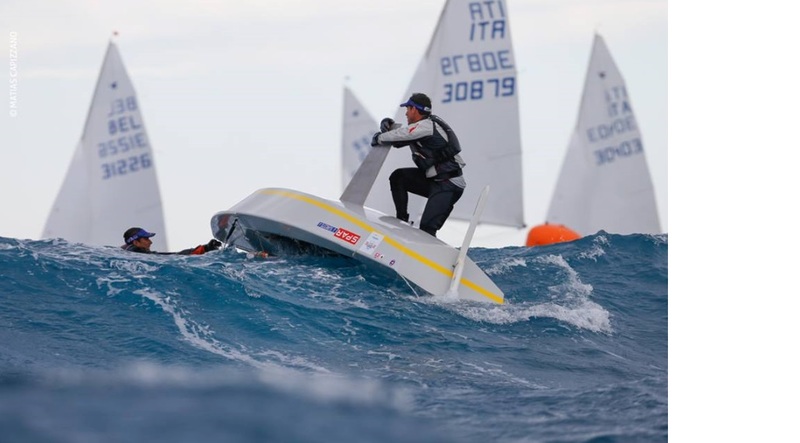 This one is more of a cry for help from a small skipper: how do I self-rescue after a capsize? 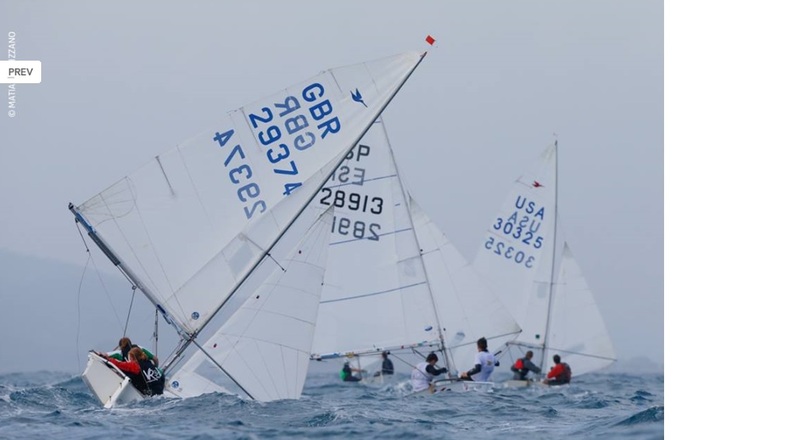 The first day of the 2017 Snipe North American Championship in Fort Lauderdale was epic: an 18-22 knot easterly, and a huge ocean swell overlaid with smaller mixed up waves rebounding off the beach and reefs. 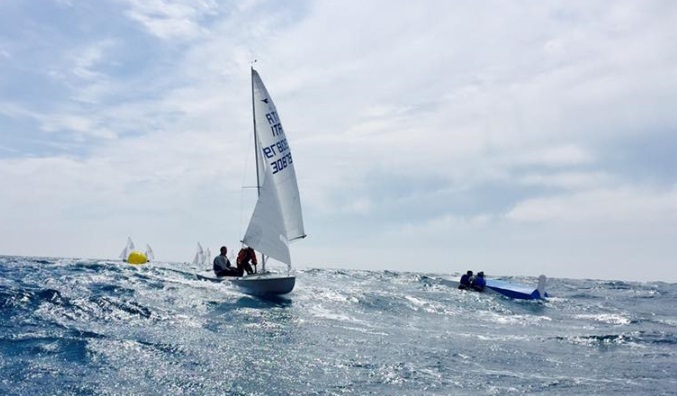 It was a great day for racing Snipes—and also a day where even a small mistake can lead to a capsize. While we’ve gradually improved our tuning and boathandling to compensate for my smaller stature, it wasn’t until my very first capsize as a skipper that I thought about how much size matters there too. So in an attempt to share knowledge and perhaps spark some solutions, here’s what happened. In the first race of the North Americans, Linda and I rounded the weather mark in about eighth place and jumped up onto a plane. The mark was low, so we launched the pole and were just settling in for a fun ride when a wave simultaneously pushed the boat to leeward and washed me out of the boat to windward. I managed to hold onto the mainsheet, but all I could do was watch as the boat pirouetted into a death-roll-capsize. Linda ended up pinned under the main but managed to swim herself clear—and fortunately our closest competitor was able to head up (poled-out jib luffing furiously) enough to avoid running us over. By the time I swam around to the other side again, the boat had already turtled again. And that’s when I realized that I could not reach the centerboard. The Perssons float higher than Jibetechs, so I like to think that in my own boat I’d be able to self-rescue (though I’m not very eager to test this theory). In this particular boat, the board was well beyond my reach. Fortunately, there was a safety boat standing by and as soon as we asked for help, they came over. Brian Buckley jumped in the water, dove under the boat to release the pole launcher line, and then bench-pressed himself up onto the side rail until he could grab the centerboard. Less than a minute later the boat was upright, and he was pulling me back aboard. A side note: even if I’d managed to right the boat, I’m not sure I could’ve heeled it over enough to get aboard by myself. While the boat was upside down, the rudder had popped off—in spite of a very stiff and secure rudder lock. (As a result, I highly recommend tying in your rudder; see a photo below of the shockcord arrangement I use on my own boat.) The safety boat retrieved the rudder, and I was able to get it onto the gudgeons thanks to Brian swimming the bow into the wind. Since the boat was rolling around in big waves, I doubt it would’ve been possible to get the rudder installed again without that assistance. Next I pulled Linda back into the boat, and then we began to retrieve our various water bottles and assess any damage. (Thankfully, we were both fine and so was the boat.) Then we ambled back down to the starting area to wait for the next race. In spite of starting off the regatta with a DNF, we eventually finished seventh overall. But ever since that first race, I’ve thought long and hard about how we could’ve managed to self-rescue—and I haven’t come up with any answers. While the big waves made everything harder, even in flat water I couldn’t have reached the centerboard on a boat that floats so high. Grabbing the rudder doesn’t help (even if it had been tied on), because there are no rails on the transom to stand on and nothing but a sharp dangerous bailer within reach. 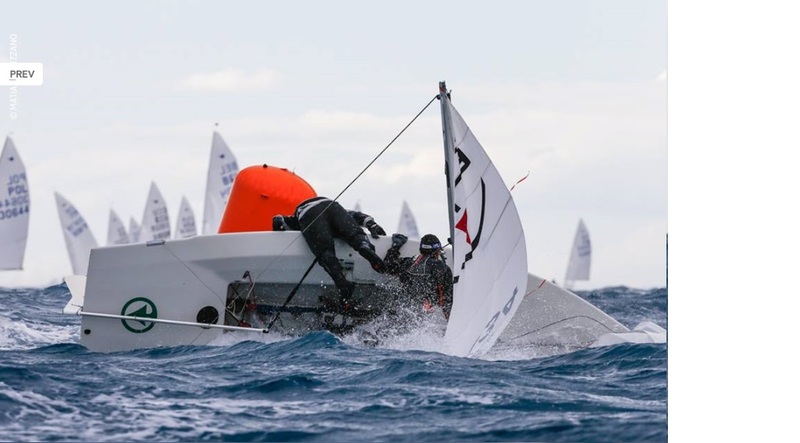 The reason I know how dangerous that bailer can be is because Charlie Bustamante cut his fingers on it during a similar capsize at the 2017 DonQ. The irony in all this is that a week before my own capsize, I had just edited their story … which is why I already knew to avoid any interaction with the bailer. Those of you who are a more typical “skipper-size” (and those with more upper body strength) may not ever need to think about this… but if anyone has ideas for how I could possibly self-rescue after the next capsize, please send them to editor snipetoday.org. Meanwhile, thanks to Lauderdale Yacht Club for the well-trained safety boat, and special thanks to Brian Buckley; Brian, when you're old enough, I'll buy you a beer. Oma kokemukseni täysin turtleksi kaatuneen veneen (pohja ylös, masto alaspäin) pystyyn nostamisesta on, toisin kuin ohjeissa yleensä kerrotaan (ja pääkuvassa näkyy), että molempien purjehtijoiden on syytä uida veneen sivulle (ensimmäinen alakuva), nousta yksi kerrallaan pohjan päälle toinen toistaan auttaen, nostaa köli yläasentoon, astua veneen roiskelistan päälle, ottaa kölistä kiinni, nojata taaksepäin ja alkaa yhdessä kammeta venettä pystyyn. Eikä siis niin, että toinen ui keulaan ajoankkuriksi (pääkuva), ellet sitten ole sen verran voimakas, atleettinen, painava, pitkä jne, että saat veneen pystyyn jopa yksin. Veteen joutuessa pysy lähellä venettä, ettei tuuli ja aallokko vie sinua ja venettä erilleen.